1.80 ACRES - 140' FRONTING ON STATE ROAD 64 EAST – EXCELLENT VISIBILITY & SIGNAGE IN PLACE...ZONED SUBURBAN COMMERCIAL CORRIDOR. (SCC)...MULTIPLE COMMERCIAL, RETAIL AND BUSINESS DEVELOPMENT OPPORTUNITIES...NEXT DOOR TO THORNTONS CONVENIENCE PLAZA...The distance from the property to I75 is ONLY...3 MINUTES! 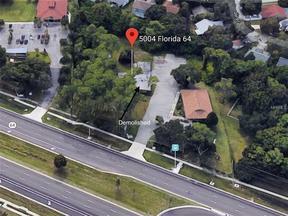 This property has future land use as a multi-family six units per acre and greater.